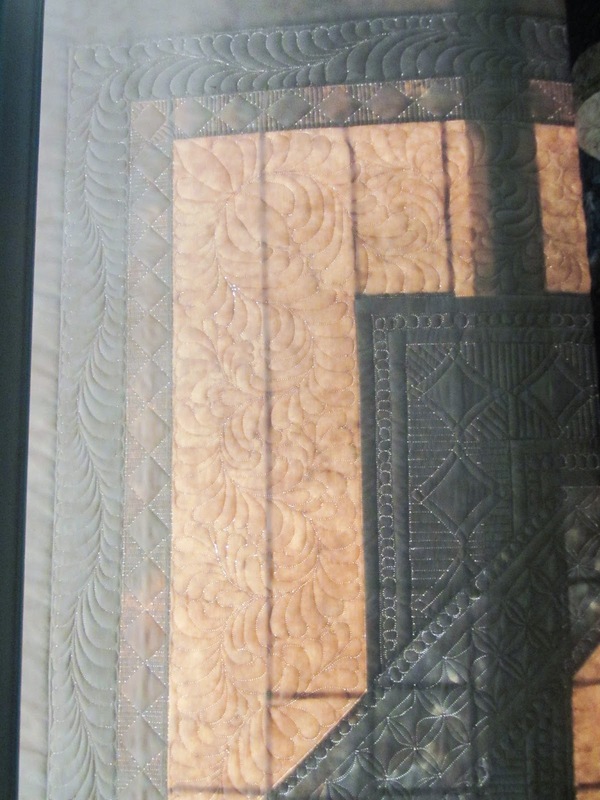 Sue Daurio's Quilting : Can someone please turn off the snowing machine? I know I'm not the only one that is really tired of the snow. Four more inches this weekend. It's March, it's got to be warming up soon. In the mean time I've got April and Amanda to keep me busy and warm. I've a scrappy chevron baby quilt for shower then end of March (certainly it will be warmer by then) and on the last border of Labyrinth. Therese (it's her gorgeous quilt) calls these the "cathedral window" quilting, I like that and I'm sticking with it. I wished I could Sue and get a little here. It's 26 but not a flake here in Texas. Wonderful baby quilt and excellent quilting. Sue know what you mean - I'm sick of winter - 3 months of it here where usually we have 6-8 weeks of it - when will it end - we have had freezing rain and sleet all day - at least lightly so it hasn't built up really badly on the trees but it is not done yet - should get a little snow still to top it off. I love the look of that border your going to do on the Labyrinth quilt. It reminds me of the Welsh quilts and those amazing borders they had on to finish the whole quilt. It really is looking amazing. And very soon much of the rest of the country will be wishing that there were aqueducts to carry your over supply of water to the parched places. Very pretty Sue! Love the chevron quilt and can't wait to see the Cathedral windows done. They threatened we would get snow in UPstate NY today but we didn't. I guess that's good. Bring on spring!! Take care now. Love the colors in the chevron quilt! I think that is my #1 favorite for color combinations. And the cathedral border looks fascinating ~ can't wait to see it finished! Love the baby quilt, how cute and fun to do. I agree with you, we have been luck with not getting a ton of snow this year but getting dumped on right now. It was about 67 degrees yesterday, now ice and snow today!! Great baby quilt. Wow the quilting you are doing. Terrific. wow, those cathedral windows are going to look fabulous. What ruler do you use to do those? I'm assuming you use the ruler while quilting it too??? That is going to be one amazing quilt when done! Nice chevron quilt too. Great colors. So AMAZING! I drool all over my keyboard every time I visit your blog! I love Cathedral windows! And the fabric unto which you marked it is gorgeous. Sewing it next to these brown and beiges make it feel warm and sophisticated. Oh...lets go make snow angels! Make the best of it! The quilting on the border is going to be incredible. You always do such nice work! Sweet little chevron quilt. Thanks for visiting today. I picked up a couple more fabric pieces today for the Triangle QAL. This is great - I always love a good chevron quilt! Beautiful quilt and fabrics and your quilting is always so neat!! It is snowing right now across the river in Iowa Sue and......I'm tired of it too! Thanks for sharing. Your work is very impressive! The colours in the chevron quilt are just perfect together! And the FMQ?.... AMAZING! 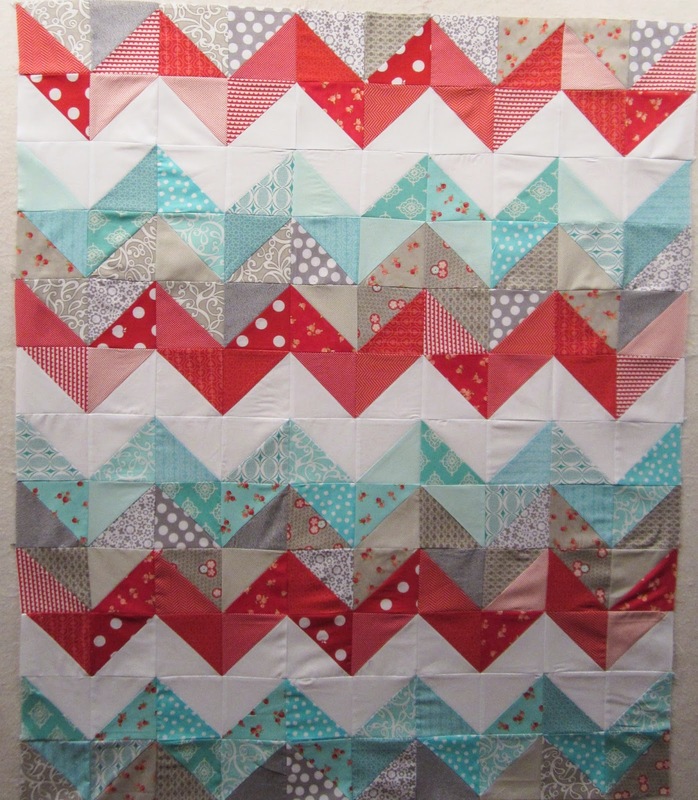 Your scrappy baby quilt is just darling!